The 1990s may not feel too long ago for many of us but with the pace of modernization in Shanghai, it feels like a different era. 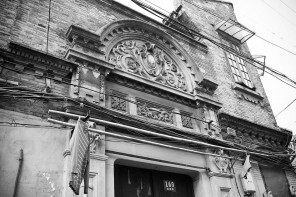 I first connected with Brigid Conklin through the blog’s Facebook page, where I share interesting bits and bobs of Old Shanghai buildings. 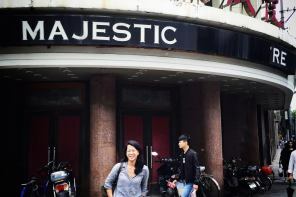 One was a snap of the beautiful Art Deco Washington Apartments in the former French Concession. Brigid reached out to share a beautifully moody photograph of the same building from 1998. 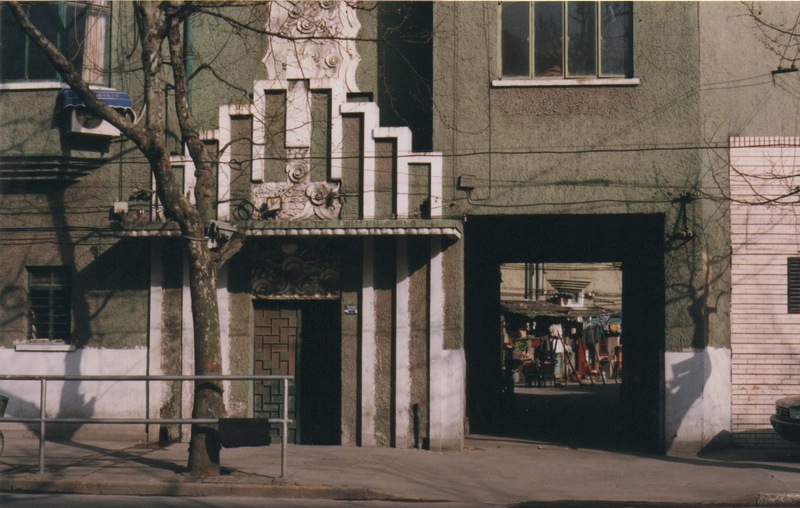 The original Art Deco gate was still intact and a spacious driveway gave the building much depth. “I have more,” she later wrote to my delight, and uploaded gems of evocative street photography, lilong activity and old buildings that still look the same or simply vanished. 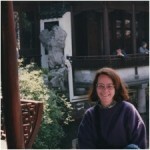 Brigid was an American expat who moved to Shanghai from Hong Kong in late 19997 and left a little over three years late. 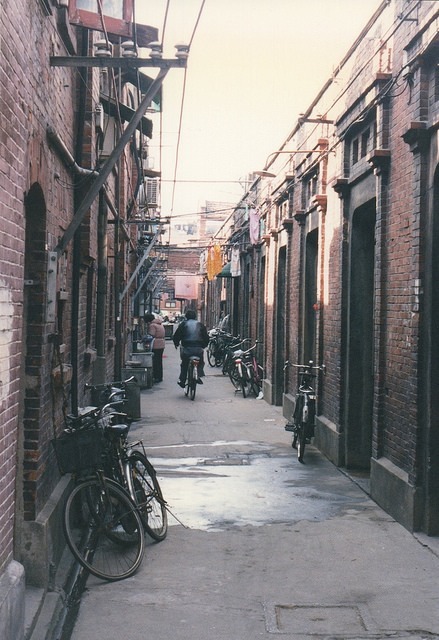 Captured in the rustic colors of film, what were casual street shots for Brigid in the late 1990s are now wonderful insights for those of us so used to modernity in Shanghai. SAT. 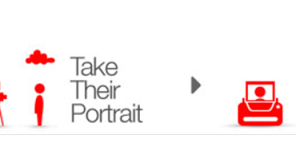 First of all, thank you for reaching out and uploading your photographs. 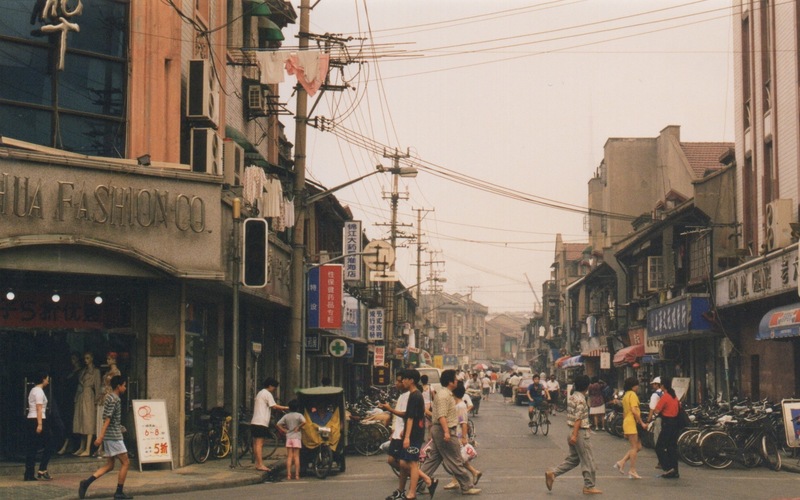 Oddly, I find that the late 1990s of Shanghai looked more like the late 1980s/early 1990s in more developed cities. In the U.S. in 1998, it was all about Beanie Babies and talk of what Bill Clinton did or didn’t do the US, what trends were you observing in Shanghai in the same year? BC: The major trend then, as is now, was change, rapid change. Nothing was gradual. After all, the city was making up for lost time. Here today, gone tomorrow. 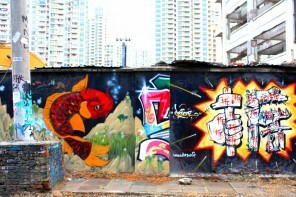 The buildings along Yan’an Zhong Lu (延安中路) were seemingly razed overnight to make way for the overhead highway. One day it was a typical street, the next it looked as if bombs had been dropped in a very precise fashion. The buildings that were left standing had been shorn of their front halves and were quickly patched up to make them appear as if they had always been that size. 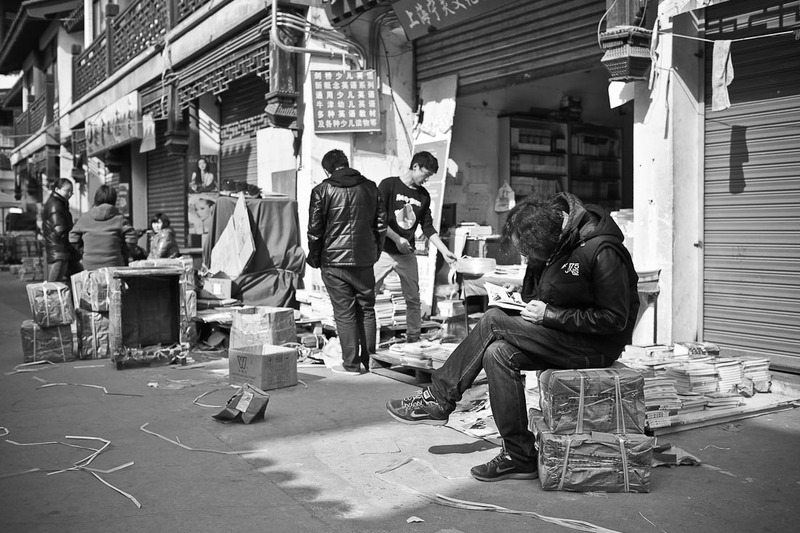 I recall strolling into a warren of hovels and shacks to the south of Jianguo Xi Lu (建国西路) thinking I will have to come back with my camera. By the time I returned a few days later everything was gone. 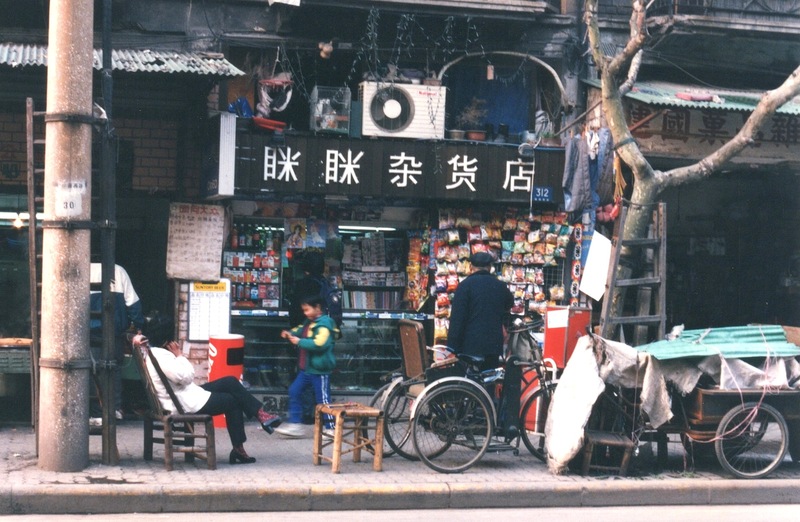 Street shop along Jiangguo Xi Lu (建国西路). Taken in 1998. By Brigid Conklin. In 1998, Bill Clinton and the Beanie Babies were also having their moment in Shanghai. One Saturday in June 1998 while running errands I noticed that roads were unusually smooth. I saw gleaming shop windows, freshly whitewashed buildings and expertly pruned plane trees. The driver sensing my confusion smiled and said “Clinton, feiji chang, po-te-man”. Ah yes this would be the route the president’s entourage would take from the Hongqao airport to the Ritz Carlton where he was staying. 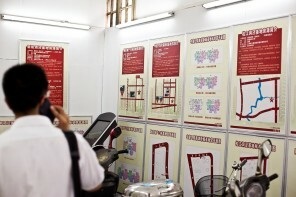 Counterfeit Beanie Babies, along with “Frauda” bags and “Bolex” watches, were removed from the Huating Market (华亭市场） for the duration of Clinton’s visit. As were all bicycles parked along the president’s route. These were loaded onto trucks and driven away much to their owners’ consternation. 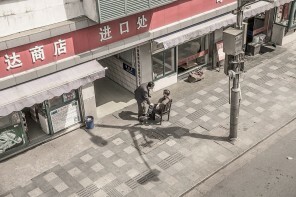 Shanghai street scene. Taken in 1997. By Brigid Conklin. 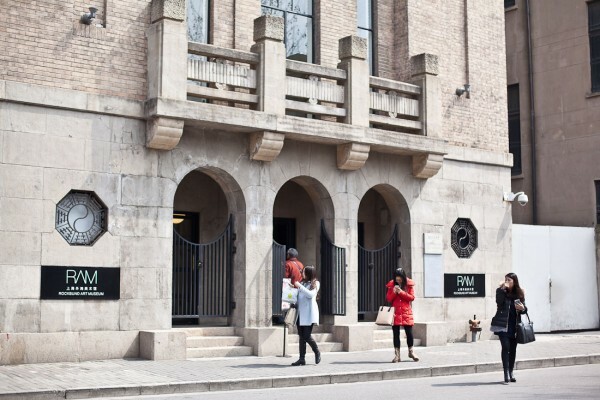 SAT: You mentioned that you lived in the former French Concession during the late 1990s. Can you describe for us where exactly and what the geographical layout was like? 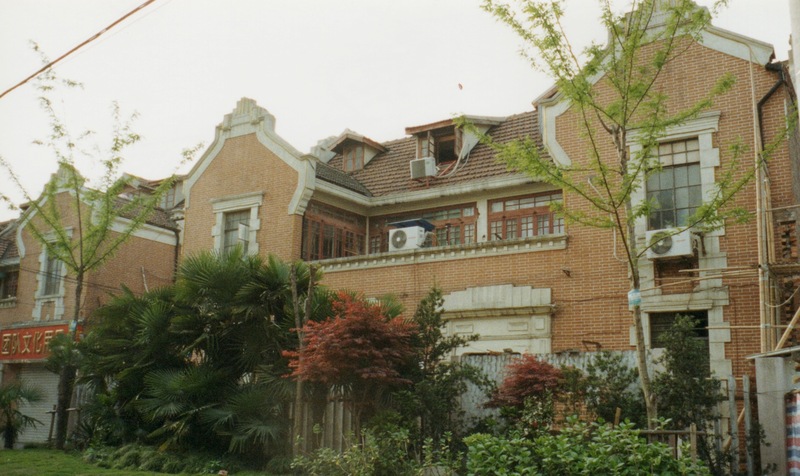 BC: We lived in a lane house off Jianguo Xi Lu between Wulumuqi Lu (乌鲁木齐路) and Yueyang Lu (岳阳路) . 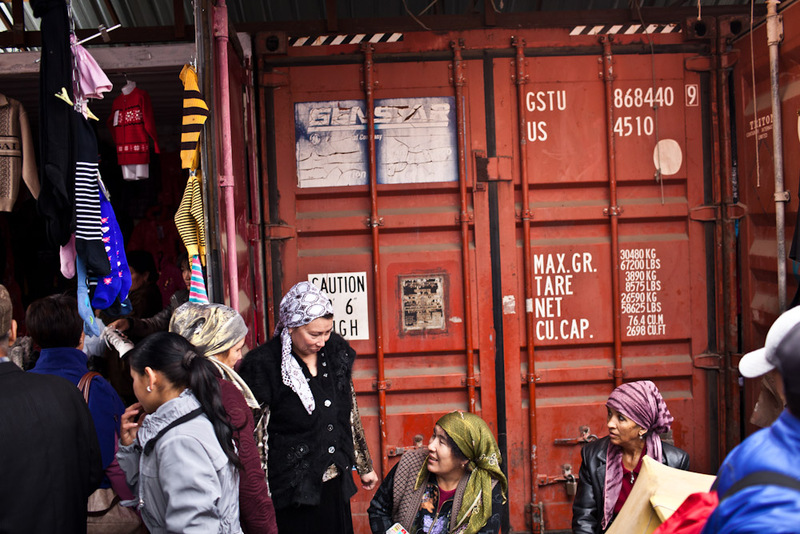 There was a small shop selling snacks and cigarettes to the left of the lilong entrance and upon entering the alleyway there were a few stalls, including a dressmaker, hairdresser and a man who pounded out errant dents in metal pots. Off this main lane were narrower lanes branching to rows on either side. There were some 55 attached houses in total. All of the houses faced southward so that each house looked into the back of the one in front of it. The houses were nearly identical although some, like ours, sported a Spanish style façade and others a more Tudor look. Some had deeper gardens in front, but all had tall walls and gates facing the narrow lanes. The houses themselves were three stories and originally had living room, dining room, kitchen and powder room on the first floor. Ours had two bedrooms, two bathrooms and two small rooms each on the second and third floors. Yueyang Lu (岳阳路) under refurbishment. Taken in 1998. By Brigid Conklin. Our house was on the east side at the end of a row of four. A garden wall separated us from the last row of the neighboring and very densely populated shikumen, Jianye Li (or lane)(建业里). To the north of Jianye were a series of low-rise apartment buildings which we could see from the upstairs windows. During our first night in the house, we were awakened by the sound of bulldozer (perhaps commandeered from its day job) and by the reflection of bright lights on our ceiling. We feared the entire block of apartments would be razed and a high rise constructed in its stead. We were fortunate that the heavy demolition was completed that night and that the project was merely a rehabilitation of the buildings. Life in Jiangye Li (or lane) (建业里). Taken in 1998. By Brigid Conklin. SAT: The lilong you lived in was featured in a 2002 New York Times article entitled “Neither Snow Nor Rain Nor, for That Matter, Mao“ with an intriguing story of how Columbia University in New York kept sending alumni mail to a Mr. Chang, whose family bought a house in the lane you lived in back in 1945. Were you able to trace such history while living there? And granted the lilong must have been spruced up for Westerners to live in, what was community life like then? BC: The history of our house was not nearly as interesting as the one in the article. Our landlord grew up in the house with his extended family. 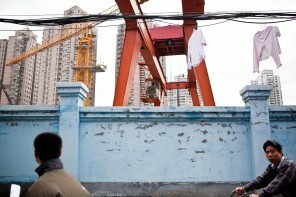 During the Cultural Revolution eight more families moved in. A faint marking on the wood floor in the living room showed that the room had once been divided into two and was one of the few reminders of the house’s turbulent past. An uncle who had emigrated to the U.S. was able to reacquire the house in about 1980. 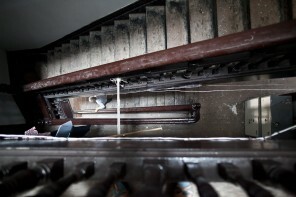 The landlord finally removed the last of the eight families in 1988. Most of the houses in the lilong were very run down and were occupied by many families. 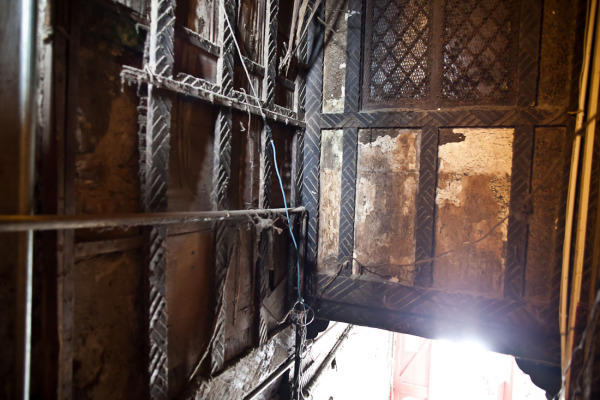 One could walk down the narrow lanes and look into the rear windows and see grimy shared kitchens with bare light bulbs dangling from electrical wires. Each wire was attached to its own meter and gave one an indication as to how many families used the kitchen. In the house next door to ours, the living room had been split into two rooms with a mother and her preteen daughter living in the front half. No doubt other rooms in the house had also been divided up. The outside gate was covered with mailboxes and the courtyard was cluttered with a couple of small plastic washing machines. 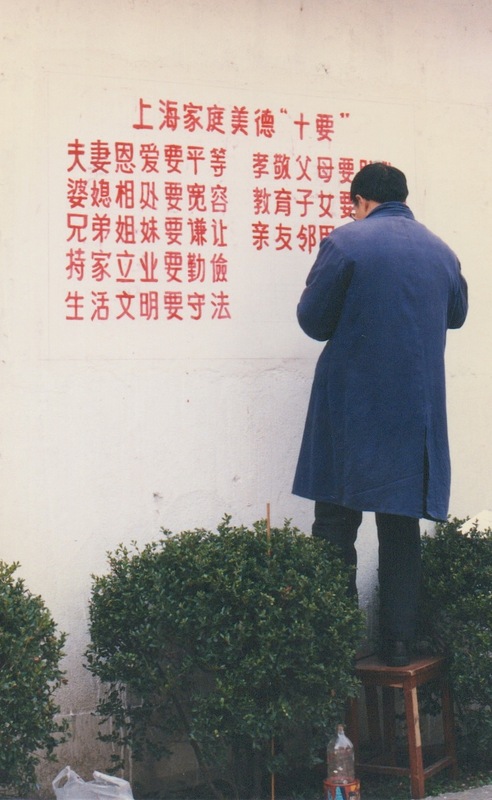 Neighborhood committee volunteers painting “Shanghai Family 10 Dos”on a wall in a lilong. Taken in 1998. By Brigid Conklin. 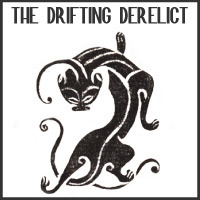 We were awakened each morning by scraping/swishing sounds emanating from the other side of the wall dividing us. I found out that it was the morning ritual of the cleaning of chamber pots with bamboo scrubbers. 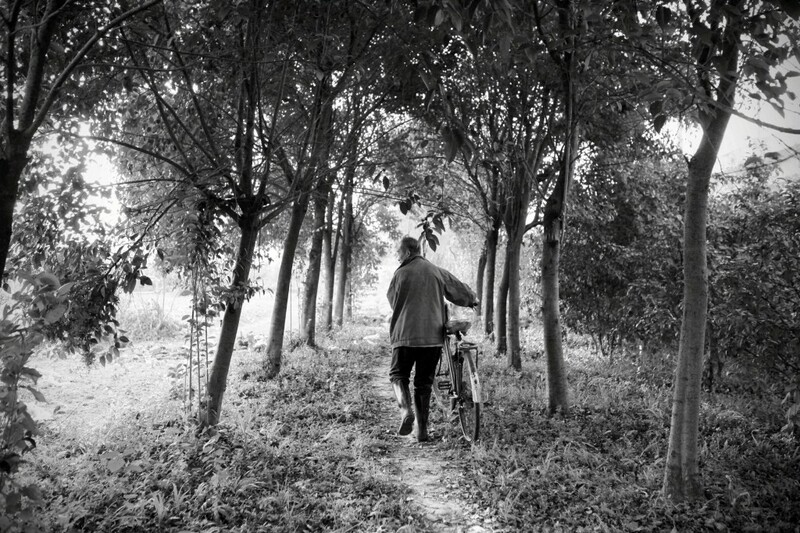 Each evening, we would hear the ringing of a hand bell wafting up and down the lanes reminding the Jianye Li residents to put out their stoves for the night. Our lilong neighbors were friendly and polite as well as very curious about us. While we spoke enough Putonghua to get around town, to shop, and to ask directions, we didn’t know enough to engage in any meaningful conversations with them. 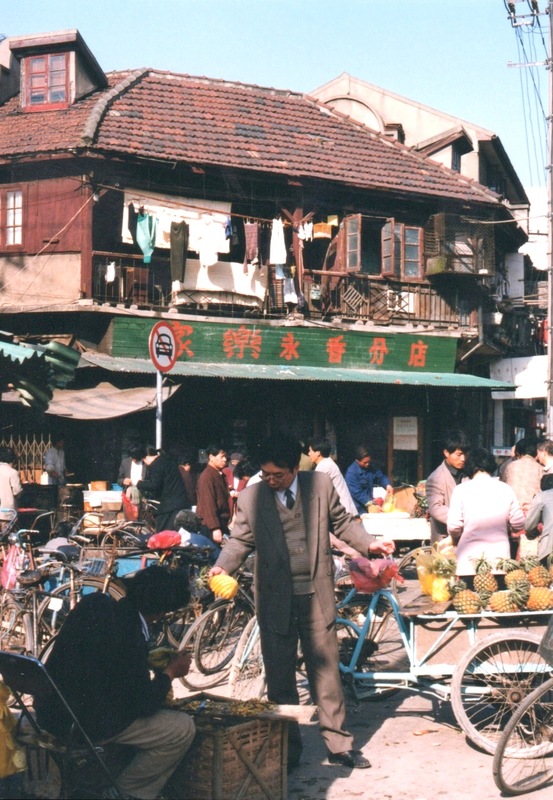 A busy street market in Shanghai. Taken in 1998. By Brigid Conklin. SAT: I love that you’ve captured what is now Xintiandi and Sinan Mansions, both refurbished (or “converted” would be more accurate”) high-end residential and commercial properties from their old lilong structures. Have you seen them since? 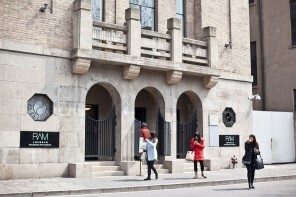 BC: I haven’t been back to Shanghai since 2007 so I haven’t seen the Sinan Mansions, but I have seen Xintiandi and was rather disappointed by it. 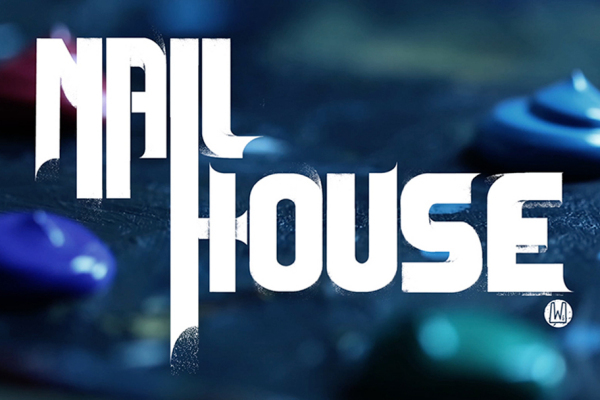 I really don’t know what I was expecting, perhaps something a bit less flashy and commercial. 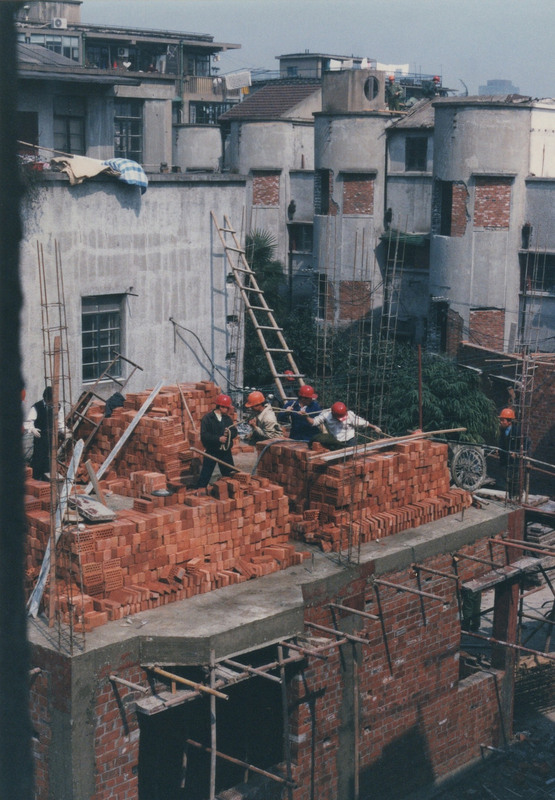 An early stage of the rebuilding had been completed before we left in 2001. 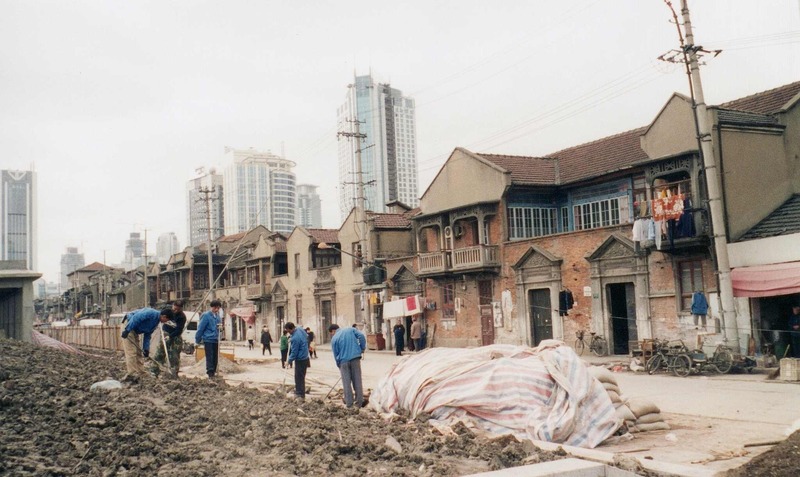 One Sunday in early 2001 we were strolling in an area where work going on around a row of un-refurbished buildings of what would become another phase of Xintiandi, when the workers in one of the buildings invited us inside. Although I had my camera with me, I did not have my flash so I was unable take any photos of the interior of the building. I did at least take one of the view and one of the existing roof work. 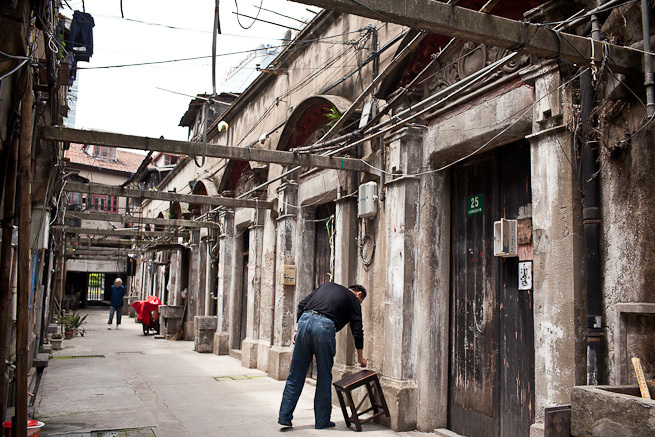 Original shikumen lane in the now-Xintiandi area. Taken in 2000. By Brigid Conklin. 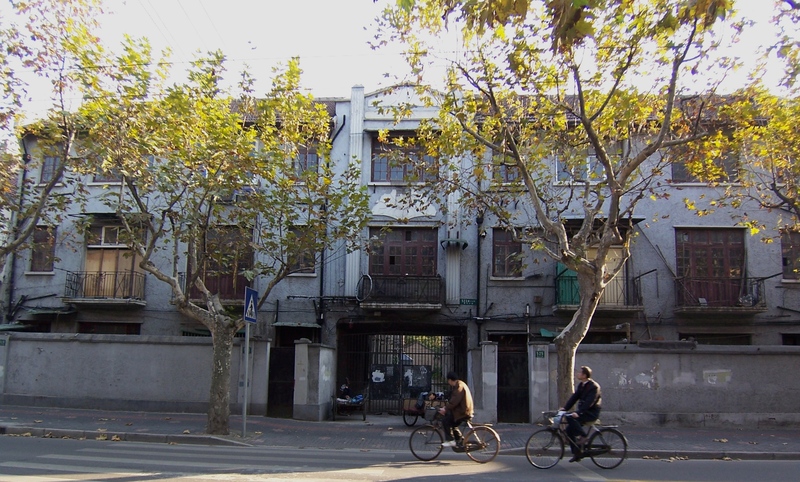 Xintiandi area before commercial redevelopment. 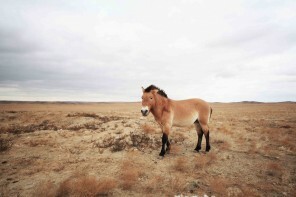 Taken in 2000. By Brigid Conklin. Original lilong entrance before Sinan Mansions was developed.Taken in 2007. By Brigid Conklin. 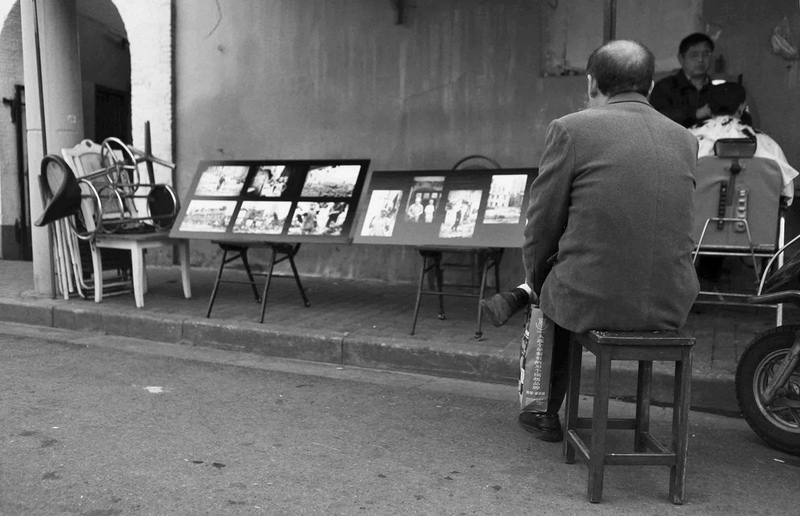 SAT: Of all the photographs you’ve made during your time in Shanghai from 1997-2007, which is your favorite and what does it evoke for you? BC: Certainly the one that brought us together is a favorite (below). I was initially attracted to this building by its color. It stood out from the many gray edifices that hadn’t seen a coat of paint for nearly half a century. Then, of course, I noticed the opening and how it revealed the bustle of everyday Shanghai life going on behind the building’s elegant western facade. Facade of Washington Apartments on Hengshan Lu (衡山路). Taken in 1998. By Brigid Conklin. I also like the mailboxes on the door of 149 Wulumuqi Lu. It wasn’t until I started scanning these photos a couple of years ago, that I realized that these two photos, taken a year apart, were of the same door. One different mailbox, same droopy door knob. What strikes me most about all the street scenes is how deceptive they are. Shanghai appears to be have been so quiet and so calm when it was anything but! Where are the taxis with their honking horns, the waves of bicycles, the motorcycles, the scooters roaring down on the sidewalks, or the buses belching black exhaust? I seem to have assiduously sought to capture a Shanghai that was as illusory as the one fabricated for the Clinton visit. 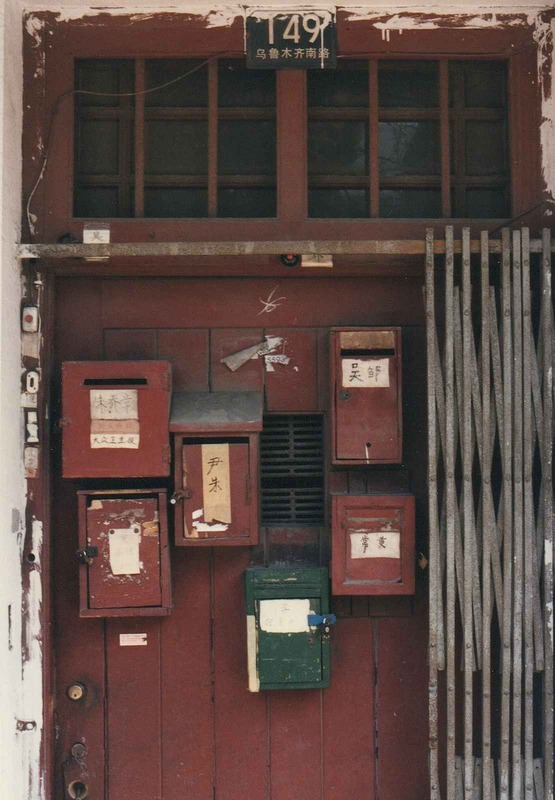 Mailboxes on 149 Wulumiqi Lu (乌鲁木齐路). Taken in 1998. By Brigid Conklin. Such a wonderful interview; excellent, Sue Anne! I enjoyed every one of Brigid’ pictures on Flickr. This is a wonderful interview! Your blog is so well written, it takes me back to the years when I was living in Shanghai. Thank you Jade, am so glad you enjoyed it! Stop by the blog anytime. Hi, I love your article very much, it is like a time machine. 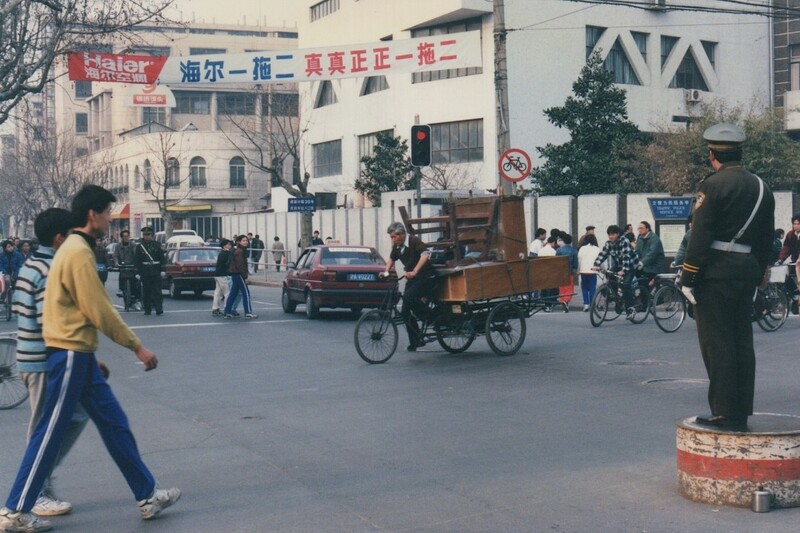 I lived and grew up on the very street in the second photograph which is ChengDu road looking north to Yanan road. These photos captured the nostalgic mood and the ambiance so well. Unfortunately most of them along with the French colonial buildings are gone. 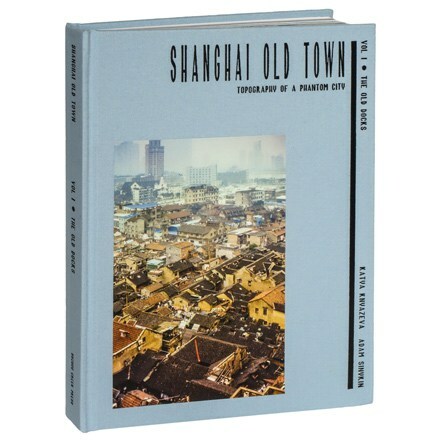 But old Shanghai still lives in these photographs and in my heart. Thanks for your kind note, Chen Xu. 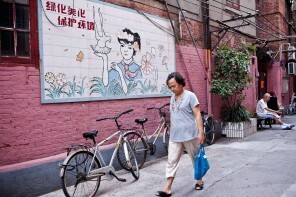 It’s always so wonderful that the photos and stories reach more closely to former Shanghai residents. The city has changed a great deal and I confess, the former French Concession has changed too but not as badly as some of the other neighborhoods. But that is how the city is. The street has a life in 20 years ago.